Leo Marienthal presented with the bugle he lost in Egypt in 1915. The Oral History Association of Australia Journal available from 21 September 2013 will include my article ‘Boyhood Memories of Person and Place’ concerning the life of Brisbane businessman Leo Charles Marienthal (1891-1969). Using an interview with one of the few people still alive who knew him, it provides a nostalgic recollection of the man and his home. 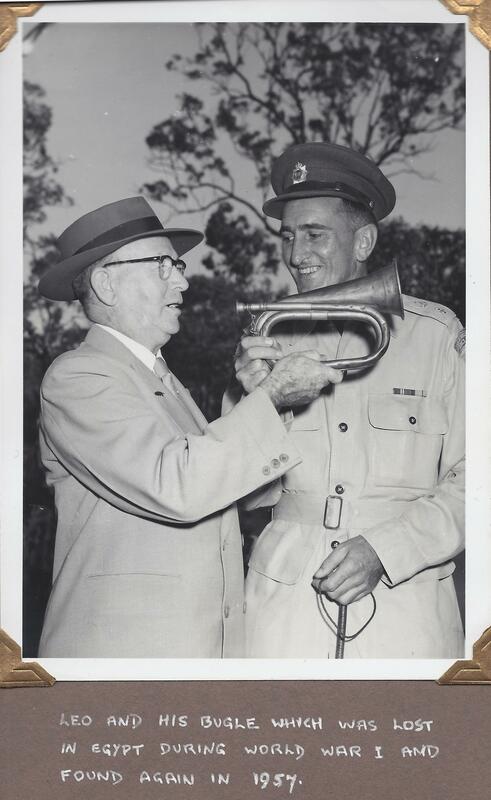 This entry was posted on Thursday, September 19th, 2013 at 6:52 pm	and tagged with 1957, Brisbane history, OHAA Journal, oral history, Oral History Association of Australia, WWI bugle and posted in Uncategorized. You can follow any responses to this entry through the RSS 2.0 feed.